Negligent on-boarding may not provoke a lawsuit, but it sure can create problems. The fastest growing class of lawsuits in America today are those related to employment law. Within this category, the two fastest growing types of cases are those concerning negligent hiring (the employer failed to meet the due diligence requirements and the employee caused harm) and negligent retention (the employer did not terminate the employee in the light of new information and the employee caused harm). While fast growing, these lawsuits are still relatively rare when compared to the rampant employer practice of “negligent on-boarding.” Negligent on-boarding is the #1 cause of costly, short-term employee turnover. In essence, negligent on-boarding is wasting the time and money spent to recruit and hire new employees by not giving them the guidance, tools, training, time, and attention they need to become productive, committed, engaged members of the team. 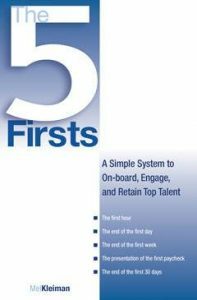 If your organization is guilty of negligent on-boarding, check out The Five Firsts: A Simple System to On-board, Engage, and Retain Top Talent. To read an excerpt and order copies, visit our website.